possible outcomes of the event. A gift-wrapping service offers the following choices. There are two ways to find the possible outcomes of compound events. branches gives the set of all possible outcomes. ways to do a third thing, and so on ..., then the number of ways of doing all those things at once is r x s x t x ..."
outcomes is 5 x 4 = 20.
hamburger, sausage, onions, bell peppers, olives, and anchovies. If they choose at random, what is the probability that they both choose hamburger as a topping? combinations of bagels and cream cheese are there? A pair of dice is rolled once. 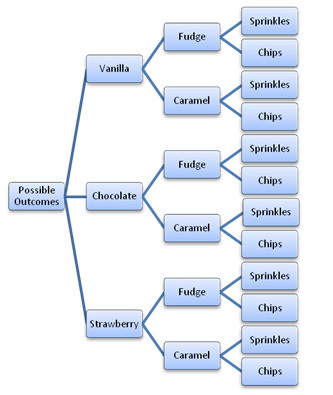 How many possible outcomes are there? second card picked is also a king? A. B. C. True or false? A survey at a hospital showed the most popular names for baby girls are: Emily, Haley, Kayla, and Samantha. be generated using the first and middle names from the list of popular names? An event made of two or more events that can happen either at the same time or one after the other. of one burger, one beverage and one dessert, how many possible meals can be chosen?